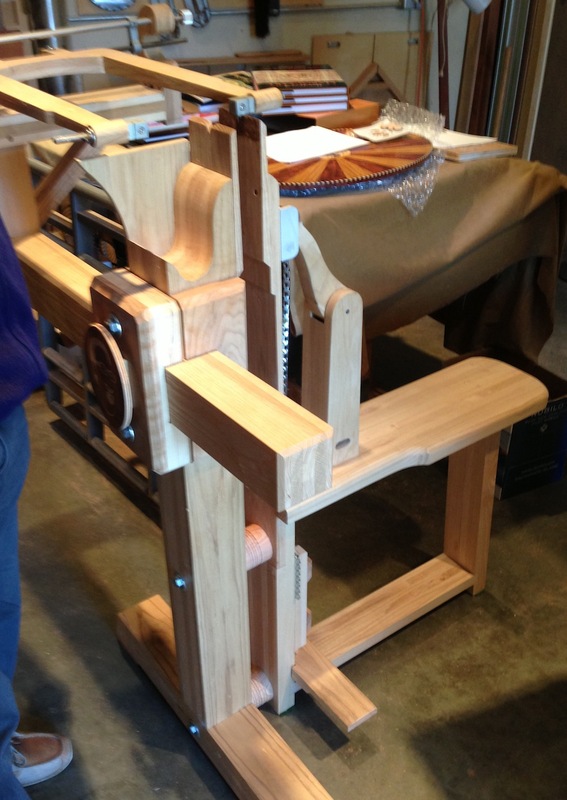 I’d planned to make more tool holders today, but remembered that there was a SAPFM (Society of American Period Furniture Makers) meeting today, with a demo on marquetry. I’ve never been to one of their meet ups, generally if I have time on the weekend I want to be in my shop, not someone else’s. I’m weird that way. I decided to attend today and I’m really glad I did. JB Alegaini did a great talk on what marquetry is, and what the different techniques are. I’m not sure I could have told you the difference between inlay, marquetry and parquetry before the class, much less what the techniques were. Basically inlay is cutting a recess into a piece of solid wood to insert something else into it. Parquetry is a geometric design using solid pieces of wood, and marquetry is done with veneers. 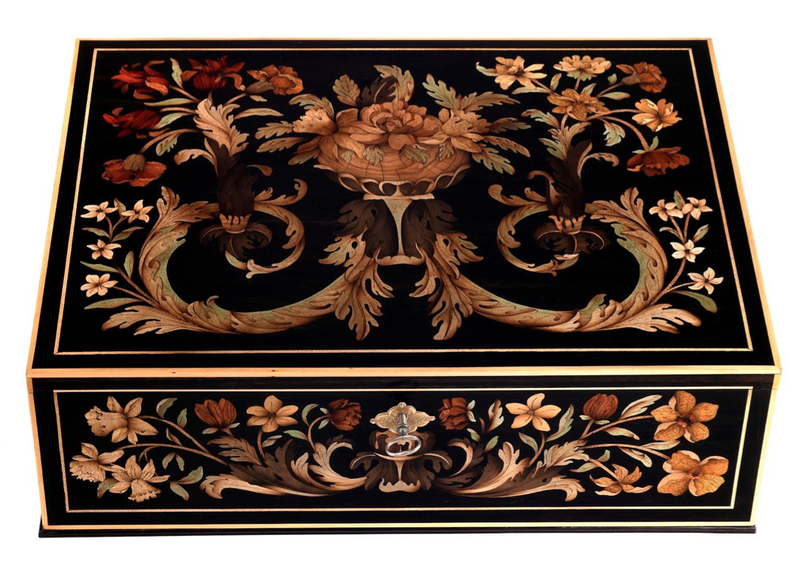 JB uses a “chevalet de marqueterie” to cut out his designs using either the Boulle method or the Classic (piece-by-piece) method. The third common technique is the Double Bevel method. I’ve seen the Double Bevel method before on a David Marks DVD. 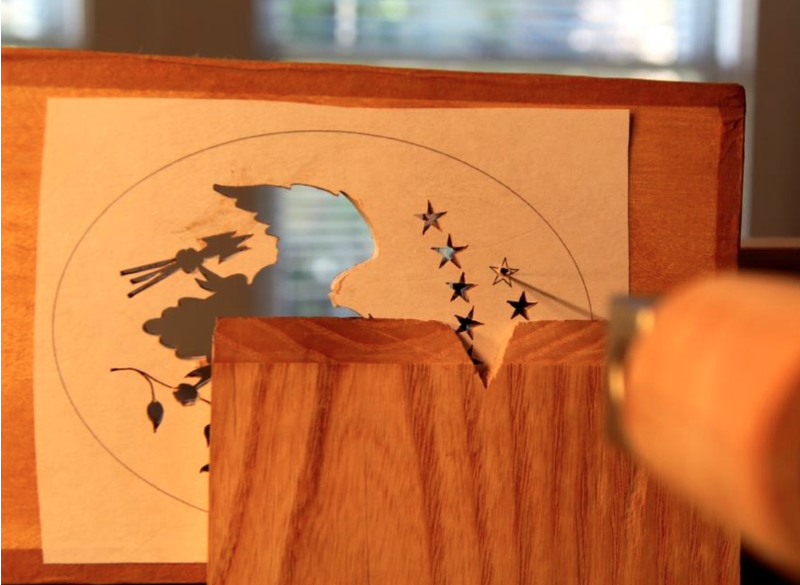 I’d always assumed that if I tried Marquetry I’d use a scroll saw, but I can see one advantages to this setup — you have really amazing control with the chevalet. With the Boulle method a packet is prepared with two or more contrasting materials. Brass, Ebony, Tortoise Shell and Pewter seem to be common materials. The design is sawn straight through the pack, and the layers separated. They can then be assembled to make two or more parts, which are reverses of each other. One might be predominately Brass with Tortoise Shell details, the other would have the materials reversed. The kerf would be filled in with hide glue and sawdust. 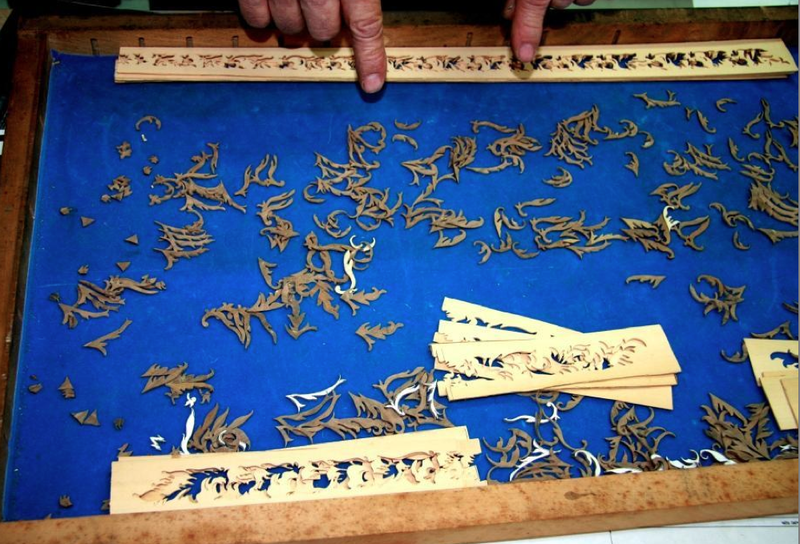 With the Classic method, pieces are cut out individually from either a single thickness, or from a packet to make multiple of each part. By very careful cutting on one side or the other of the line the kerf is all but eliminated. The pieces are assembled and the design is traced onto the background veneer which is then cut out last. I’m interested in trying this some day, but I’m a little put off by all the little tiny details.